As the name states, anyone with age of 60 years or more can open Senior Citizens’ Savings Scheme account. This minimum age is relaxed to 55 years for people opting for voluntary retirement (VRS). However person opting for VRS should open the account within one month of receiving the retirement benefits. Also the amount deposited cannot exceed the retirement benefits. Non-Resident Indians (NRI), Persons of Indian Origin (PIO) and Hindu Undivided Families (HUF) are not eligible to open SCSS account. Identity and Address proof such as PAN Card, Passport, etc. These are documents required for normal KYC in banks. It’s good idea to carry the original document for verification by bank officials. On submitting the filled up SCSS account opening form along with required documents, bank would open the account and provide with the Pass Book and acknowledgement of the amount deposited for the same. The SCSS account can be transferred from one branch to the other by filling up Form G. For deposit amount of more than Rs 1 lakh a transfer fee of Rs 5 per lakh is charged for the first transfer. For subsequent transfers the transfer fee is Rs 10 per lakh. There is no transfer fee for deposit amount of less than Rs 1 lakh. A person can invest maximum of Rs 15 lakhs in Senior Citizens’ Savings Scheme. You can open multiple accounts and joint account with your spouse only but the total investment across all accounts cannot exceed Rs 15 lakhs. Spouses can open separate accounts with Rs 15 Lakh limit for each of them. So a couple can invest maximum of Rs 30 Lakhs. The minimum investment is Rs 1,000 and can be increased in multiples of Rs 1,000 thereof. Amount below Rs 1 Lakh can be deposited in cash while any amount above that has necessarily be deposited using cheque. Also Read: How to Calculate Income Tax for Senior Citizens? The joint account can only be opened with spouse (husband/wife). The age criteria are applicable only for the first holder of the account. The age of second holder does not matter. In case of death of first account holder, the account can be continued by second holder if the total investment in SCSS by second holder does not exceed Rs 15 Lakhs limit. In case the Rs 15 Lakh limit is breached, the amount exceeding Rs 15 lakh is refunded to keep the deposit within the investment limit. Spouses can open separate accounts with Rs 15 Lakh limit for each of them subject to their individual eligibility. So a couple can invest maximum of Rs 30 Lakhs. The interest income and hence tax liability arises for the first holder only. The interest rates offered on SCSS is 1% above 5 year government bond yields and is reset at the start of every financial year (April 1). From April 1, 2016 the interest rate on SCSS would be reset every quarter i.e. in April, July, October and January. For FY 2018-19 (July to September 2018) the interest rate is 8.30%. Once invested the interest rate remains unchanged over the tenure of the deposit. The interest earned is paid on the last working day of every quarter – March 31, June 30, September 30, December 31. The payout date remains constant irrespective of date of deposit. The payment can be made directly to depositor’s account through ECS or post dated cheques. 1. Withdraw the amount by filling up Form E and submit the same along with Passbook. 2. The scheme can be extended by 3 years after maturity by submitting required Form B within 1 year of maturity. The extension is considered from the date of maturity and not from the date of submitting form. 3. In case the amount is neither withdrawn nor requested for extension with in 1 year of maturity, the account shall be treated as matured. The money can be withdrawn anytime after that. You would be paid interest applicable to Post office Savings Accounts (currently at 4%) from the date of maturity to the month preceding the withdrawal. There is no penalty in case the account is closed in the extension period after maturity period of 5 years. Also no loan is available against SCSS deposit. Nomination can be made at the time of opening of account any time thereafter by filling Form C. Nomination is also possible for Joint account. But in case of joint account, the money would be passed to the survivor of the joint holder. Nomination would come in effect only on death of both the joint holders. 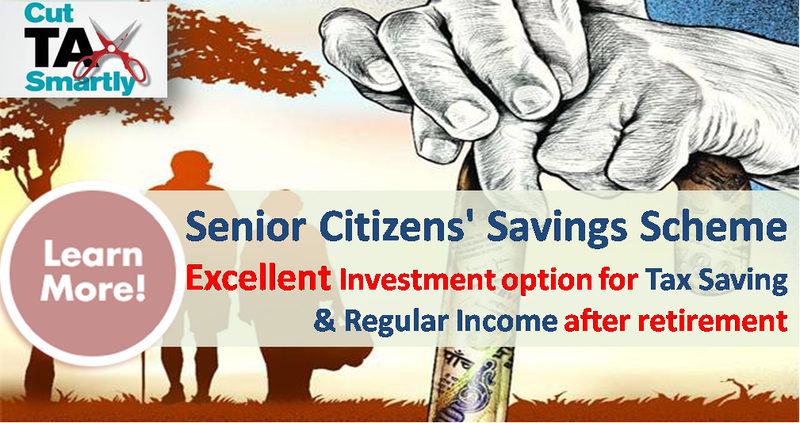 The investment up to Rs 1.5 lakhs in Senior Citizens’ Savings Scheme is eligible for tax deduction u/s 80C. However the interest earned is fully taxable. The interest income is added to the income of the investor and taxed according to the marginal tax rate. TDS (tax deduction at source) is deducted @ 10% of interest paid in case the annual interest is more than Rs 10,000 in a financial year. However if your total income for the year is below exempted limit of income tax, you can submit form 15H (for more than 60 years) or 15G (for less than 60 years) to the concerned bank/post office to avoid TDS hassles. TDS is major point of contention for senior citizens as many of them do not have taxable income after retirement. Penalty on closure of account before maturity. Senior Citizens’ Savings Scheme is a good scheme for retired people looking for regular timely payouts. However this might not suit people in higher tax bracket as the interest income is fully taxable. They might want to evaluate systematic withdrawal plan in debt fund or tax free bonds. Have you invested in SCSS for yourself or for your parents? My father invested 5 lakh in scss jointly with my mummy this year Aug 2018.Now I also want to invest in her name only (NOT PAPPA) in SCSS. Now my Q is How much I could invest in her name Maximum and When? Can I invest in her 12.5L or 15L and should I have to wait for complete this finance year?APRIL-2019. Note- my mummy is Home-maker. My father had invested 5L in scss in post with joint my mummy. (Date- 20-Aug-18).mom is house wife. Now I want to invest more money in my mom’s name. Now my Q is whether I can Invest full 15L or just 12.5L in my mom name? And when I can invest them.Should I had to wait for completing fiscal year? When I can invest money ..
Can one after seven years of retirment open scss a/c. You’ll get interest for half-year this year, but SCSS is 5 year product. Next year you’ll get full year interest which will lead to TDS! If husband invest 15 lakh in scss in name of his wife (age above 60) then interest arise will be clubbing in husband’s income or not?